Christmas crafting and fluffing has started around the old homestead. I'm trying to keep it simple and thrifty this year. Every year I try to add a few new ornaments. Last year it was all dollar store and this year I'm making a few and altering a few dollar store ornaments. I bought three ornaments from the dollar tree and did a quick makeover. I started with this swirly ornament... pretty but very plastic looking. I liked the shape but I wanted to add a little something extra so I tried three different looks. I simply painted on white glue and dusted it with white flocking powder mica flakes and clear glitter. I added silver glass glitter to the tip. For this one I mixed flocking powder clear glass glitter and silver glass glitter. I added a little dove on a bed of snow and a little vintage hymnal paper. I added clear glass glitter and mica flakes to this one and silver glass glitter to the tips. I bleached a tub full of bottle brush tress and added one of the minis to the center. I flocked the tree with snow that is sold for trains scenes and sprinkled it with clear glass glitter and mica flakes. It was a quick and thrifty up grade,I only purchased the three new ornaments for a total of three dollars. Everything else was in my craft stash. I'm making a few more ornaments, I'll share those later. Beautiful redo! Great that you can see something and have ideas on how to make them better. Oh Karen, these are all so pretty! I love the one with the bottle brush tree. These are awesome. You're so creative! Holy magic trick, how did you get the dove in there LOL! They look like a million bucks now! So clever. They look expensive and elegant now! The look very expensive now Karen. Nice job. They are simply gorgeous!!! Forgive me but I am not familiar with flocking or mica powder. What are they and where can I get some? Craft store - near glitter? So sorry to sound silly, paint is my thing, but I really love the look you have created! They are just gorgeous! Thanks for sharing. They are so beautiful. Love the photos. These are beautiful. I love the idea of adding stuff to the inside. I wonder if our dollar tree has any interesting ornaments? You certasinly made yours look more expensive-great redo! The ornaments look lovely! Good job! Very pretty Karen! I would have never guessed that they were from the dollar store! Beautiful job! I love what you did with these! So pretty! Wow they look fabulous! I would have never guessed they originally came from the Dollar store! Loved all three ornamaents. You took something so simple and made them absolutely elegant. And for such little cost. I'm so impressed. Very very lovely! I'm a new blogger and am so glad I found you here on Seasonal Sunday. Hope to be joining this group soon. Everything I see is just beautiful. Very charming blog. Glad I came and I'm signing up to follow! Your ornaments are gorgeous! No way do they look like something from the dollar store. Just lovely! What a great transformation! Love them all! Have to make a trip to dollar tree now. Incredible transformation. Wish I could see that much potential in Dollar Store merchandise. They turned out wonderful, and I love them combined with your silver! I also love Dollar Tree transformations too... Hope drop by to see mine! Thanks for sharing, have a wonderful week! Those look very festive and pretty. You have a real knack for taking the ordinary and making them look fantastic! The bird IS the best. Very unique. They all look great, but I think the one with the dove is my fav! They are beautiful...I never would have thought you could make them look that good. I'm w/ Cindy, the dove is my fave, too. Beautiful job Karen. They look like a million bucks for sure now! Adorable ideas!! I was just at the Dollar Tree and couldn't believe the pretty things they had in the ornament section! You really took these to the next level -- love the nest of music paper! Gorgeous. So thrifty and yet your display looks like a million bucks. I'm a sucker for bottle brush trees. The bleach method looks like it worked well. Thanks for visiting and following. I'm following back. Wonderful ideas for your ornaments, they are all so pretty! I love the one with the little bird, the ornament makes a pretty little cage for him. Thanks for your visit and kind comment. I hope you have a great holiday! Hi Karen and fellow Jersey gal! You have a beautiful blog here...very nice to look at. I just wanted to stop by and thank you for leaving a comment over at 21 Rosemary Lane. What an awesome idea! I've done things with dollar store ornaments, but nothing as gorgeous as what you've done!!! Fabulous job!!! 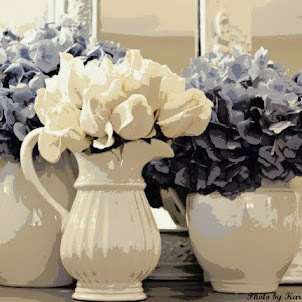 Coming over from Savvy Southern Style's Blog... Your ornaments are SIMPLY Gorgeous... The Dove one is my favorite... :) Beautiful Job!!! Your clever post has been featured at "What's It Wednesday". Feel free to grab a featured button. Hi Karen. Love the ornaments ... they look very expensive now. Your pictures and staging with the silver is very professional. Audrey Z. at Timeless Treaures. What a great idea~I love the bird ornament~it's beautiful! Thanks for posting. You worked wonders with simple ornaments and glitter. Great job. I'm glad you came for a visit earlier! I'm glad to be following you! This ornament is amazing! You're going to be hired by Anthropologie as a designer if they catch sight of this darling ornament!!! PS I'm having my first linky party on 12/13. It will be "Christmas Scape" themed, tablescape ~ landscape or anywhere else in you home that you've added a touch of Christmas! I'd LOVE for you to link up! My blog is http://www.itsoverflowing.com/. This is one of the most gorgeous ornament re-dos I have ever seen. Divine!! love how you did that ornament. Especially, the bird, of course, since I am such a nesty, bird type person. what a great vision you had for these ornaments! Just love them.